My father has spent all of his adult life as a chief engineer in the merchant navy and although he’s now retired, I’m sure he still retains lots of useful information which I could tap into. Yesterday he stopped by to drop off a birthday card and I introduced him to the project. I explained some of the difficulties I’d been having trying to find a balance between motor power and battery supply. He suggested using hydraulic motors. 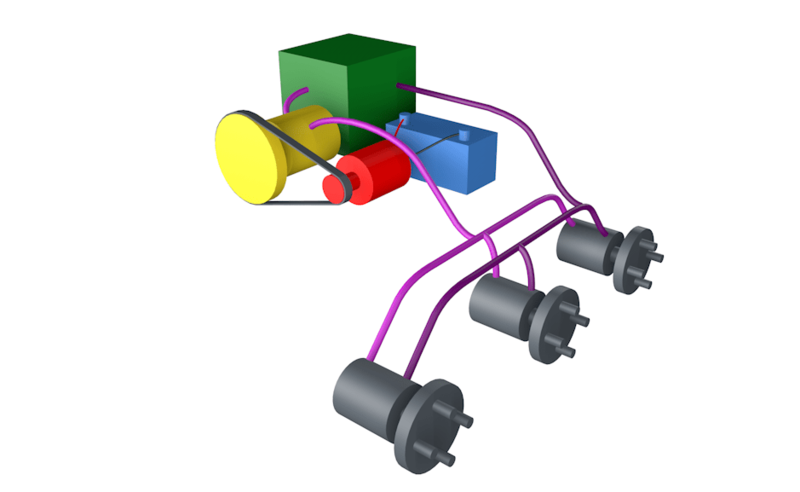 With hydraulics, an electric motor powers a pump, which in turn drives oil at high pressure via flexible hoses to any number of hydraulic motors. The ship’s winches were powered in such a way. Interestingly, shortly after he’d left I visited the endless-sphere forum where I’d been asking about how power is divided between motors and somebody else had also suggested using hydraulics. The motor can be kept spinning at its optimum range and increase the lifetime of the motor. Swash plate pumps allow forward reverse + variable pumping speed. Thanks Brett. I hadn’t realised that efficiency was a problem but the weight and added complexity put me off in the end so I’ve decided to stay all electric for the moment but will keep hydraulics in the back of my mind for future upgrades.